Birmingham Santa House 2018 – AKA Birmingham Santa Haus. Santa Haus returns to Shain Park for the 2018 Christmas and Holiday Season for Santa Claus visits. Join Santa Claus for the 2018 Holiday Season at Shain Park in Birmingham for the annual Santa House. Santa House begins after the November 30 annual holiday tree-lighting event and runs through Christmas Eve. 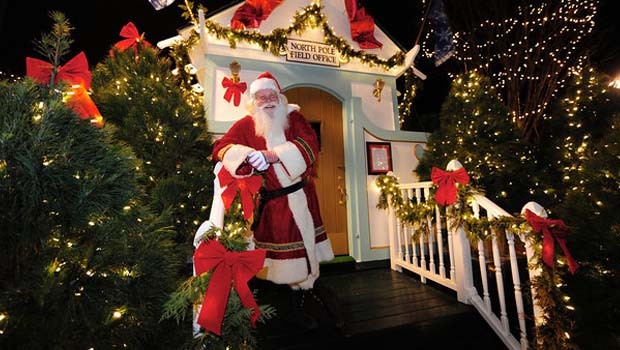 Birmingham Santa House opens at 6:30p on November 30, 2018 at Shain Park following the annual Birmingham, Michigan Tree Lighting Ceremony. Following opening night, the Santa House will be open on weekends through Christmas. Children may give Santa Claus their Christmas list and have their picture taken with him. A $5 donation may be given for charity. Birmingham Carriage Rides – Birmingham will also offer carriage rides for the 2018 Christmas season on weekends from November 24, 2018 through December 24, 2018. CLICK HERE for details. For more info, call Birmingham PSD at 248-530-1200.
photo credit – thanks to our friends at enjoybirmingham. See our EVENTS / THINGS TO DO TAB on our website for more Christmas and Holiday events, activities and things to do in Metro Detroit and Oakland County, Michigan. Birmingham Santa Claus House photo credit – thanks to our friends at enjoybirmingham.